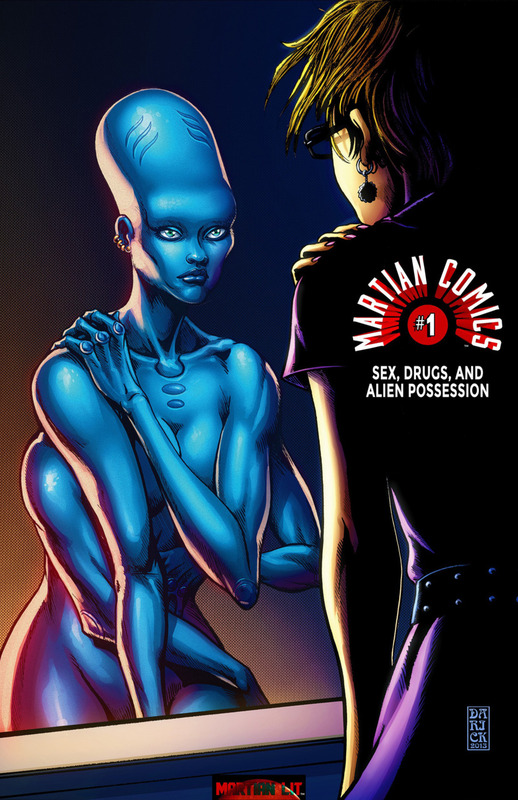 Martian Comics #1 is a cross between When Mars Attacks, and Timeline, except without the traditional idea of alien invasion. Izzy is a “normal,” but bored college student who daydreams of martian cities and martian orgies with vivid detail. Her unnamed alien self eventually becomes bored with being who she is, and tries one of the few illegal things on Mars. As the possession of Izzy gets longer, her behavior becomes odd, and gains some negative attention. The martian landscapes are gorgeous, filled with oddly alien architecture yet, earthy buildings. Part of me is curious to know why a majority of the martians are naked, or nearly naked with some expectations. In contrast humans, are drawn almost stereotypical in appearance with the exception being Izzy herself since she has bright colored hair. This story is not for children, just a fair warning.